Central Asia (Pamiro Alay, Alayskiy Range). On cliffs, rocky slopes at 1,800-3,600 m.
Rhizome short, stems 10-25 cm. Plants tight cushion-forming with many underground woody runners to 10 cm long. Leaves broadly spathulate, 1.5 cm x 0.5 cm, or 2.5 cm x 0.3 cm. Bract-like leaves 8-10. "Flowering star" to 2.5-3.5 cm across. Flowering heads 3-5 in number, 6-8 cm across. Stems and foliage white-pubescent. V - early spring to late autumn, in St. Petersburg April-October. Fl - May-June. Fr - August. P - by seed and by division. Does well in dry places on slopes. 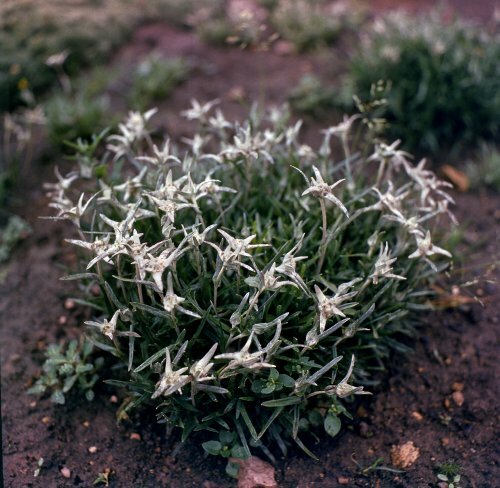 Can be used as a groundcover plant and in the rock garden. Z 5 (4). New. L. nanum (Hook. f. et Thoms.) Hand.-Mazz. Central Asia (Pamiro Alay, Kara-Dzshulga). In high mountains meadows on moist clay slopes. Plant mat-forming. Stem 5-7 cm. Stem leaves do not form a "flowering star". Flowers inconspicuous. V - evergreen. P by seed. Requires full sun. Can grow in dry places and can be used as a groundcover plant. Z 5 (4). New. Also of horticultural interest are L. palibianum Beauverd and L. conglobatum (Turcz.) Hand.-Mazz. Both species occur in the Far East. L. palibianum occurs in Ussuryiskiy Kray, L. conglobatum occurs in the SW and adjacent regions of Siberia, the Altay, Mongolia and N. China. 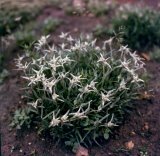 The "stars" of L. palibianum are up to 10 cm diam., white or rarely greenish or yellowish. L. conglobatum develops many "stars", 5-7 cm diam. Both species are suited to the rock garden. Z 5 (4). L. conglobatum is new.